This appetizer is a remnant of the Turkish influence in Yemen. It makes for a great sahoor idea during Ramadan. 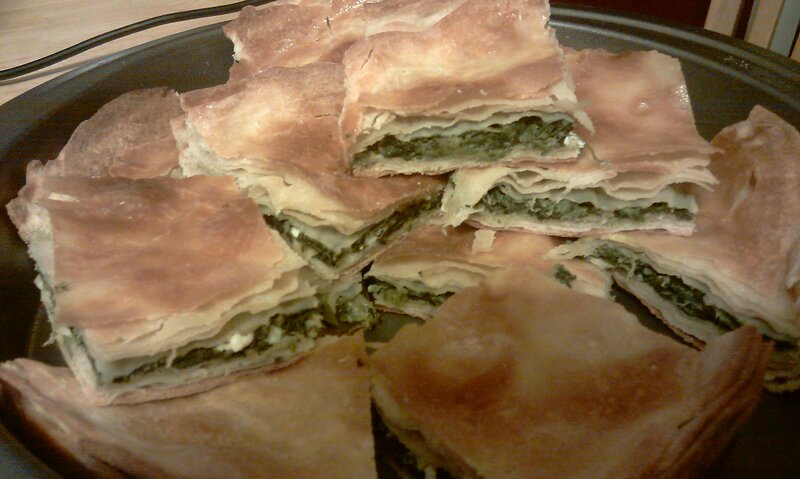 I used a light spinach filling, with feta cheese, and an egg. For the dough click here–I used half ingredients listed . If you are feeling particularly lazy you may use fillo dough instead–but it won’t be the same, but it definitely works. 7) about 3/4 of a cup of melted ghee (clarified butter) or butter–for brushing in between layers. In a frying pan, under medium heat, cook the spinach with the olive oil until all the water is evaporated from it. It shouldn’t take long, since you have already squeezed out all the water from it. Season with salt and pepper. Turn it off, let it cool and then add in the feta and the egg and mix well. Divide the dough into 10 balls of equal size. With a rolling pin roll out each–pretty thin–to fit a 9 inch in diameter baking pan. Grease the pan with the melted ghee or butter, and start layering 5 of the rolled out dough in the pan–making sure to brush the ghee or butter in between each layer. On the 5th layer, spoon in the filling and level it. Then finish off the rest of the layers of dough. Brush the last layer with egg yolk and place in preheated oven at 375 degrees until golden brown. Cut with a pizza cutter, and enjoy.